In the world of the Military/Defense/Tactical components, precision, reliability and durability are the absolute rules. This is one of the reasons that JG Plastics has been a leading molder of high tolerance parts for major defense contractors since 1975. And JG Plastics is recognized by the U.S. Department of State as an ITAR registered manufacturer. 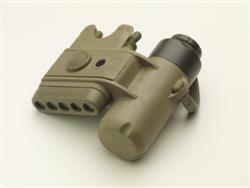 Meeting stringent Mil-Spec requirements begins with precision tooling. With our in-house mold making department, we are able to build molds to the exacting specifications required for "mission critical" projects. We routinely produce ITAR restricted parts and assemblies, with all work completed at our facility located in Costa Mesa, California. Working closely with engineers and designers, we are able to help create parts that perform as expected. Many times we are able to redesign parts to make them better, lighter, stronger, and more cost effective. We then use various molding techniques including overmolding and insert molding. Our efforts have saved millions of dollars for our customers, while producing superior products for soldiers and law enforcement agencies. An important segment of the defense industry is the requirement for high-end connectors used in missile programs, guidance systems, as well as for many other military applications. Many of these connectors are made from thermoset materials that can withstand extreme environments, while remaining stable and functional. JG Plastics has the expertise and capability to produce precision military connectors in either thermoplastic or thermoset materials. 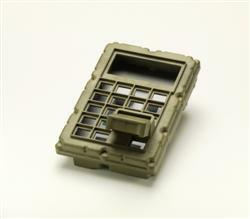 Our expertise in processing highly engineered materials has put us in the forefront of military / tactical injection molding. When failure is not an option and lives are on the line, JG Plastics has the expertise to get the job done right. Our customers trust us to provide them high quality, precision parts and on time delivery with each and every order. Whether we’re molding complex electronic housings, tactical lighting, weapon attachments or controls, we approach the project with the same focus and intensity. Using Scientific Molding Principles, along with over 40 years of injection molding experience, we are able to get the proper performance from our molding resins and materials. Our overmolding and insert molding capabilities are second to none. Many of the projects we work on require secondary operations such as sonic welded inserts, heli-coils, EMI Shielding, assembly, gasket application, post molding annealing, machining, decoration and painting. Whatever the requirement, we can handle it for you. We at JG Plastics are proud to be a part of many projects that save lives and preserve our freedom and way of life. Please contact us if you have any questions or have a defense injection molding project that you would like us to help with.